It's official: our homes are getting smarter. You can already automate many parts of your home from lighting to temperature to get it just the way you want it, but now there's a new product to add to your home automation wish list. 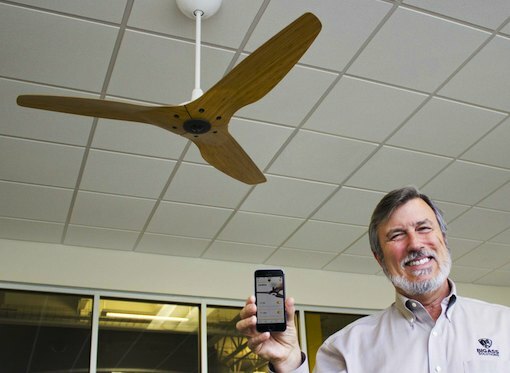 The Haiku Ceiling Fan with SenseMe has Wi-Fi so you can control it from your smartphone (iPhone only for now, though an Android app is in development) as well as motion and temperature detectors so it can start cooling when it senses someone in the room. You can either program the Haiku or let it learn your cooling preferences over time, a lot like the Nest Learning Thermostat. Though this seems like a great addition to our home automation toolkit, the high price tag—$1,045—does make wonder just how much it's worth not to have to turn our ceiling fans on and off. After all, we could pick up a Nest for $250 and bank the savings while remembering to turn our ceiling fan on and off, though we probably wouldn't be getting a fan as high quality as the ultra-efficient Haiku, whose super strong bamboo blades are hand-balanced for silent, wobble-free performance. It's probably best to wait until more affordable alternatives appear on the market.